Dear Big Baby Davis ~ way to go... You messed up Shaq's thumb and according to the AP, he has to come to Baltimore today to see Dr. Graham. Thumb wars are dangerous. Dear Danny Ferry - I see Jamison is performing better, as he gets into the Cleveland groove. The Cavs have won 3 in a row, so I'm feeling much more comfortable about the trade. However, now Cleveland and I are patiently waiting for time to pass so things could be made "right". March 21, Zydrunas can return. Until then, with Shaq out, Cavs fans have to rely on Varejao as your center. I'm pretty sure that the Knicks aren't afraid of Varejao, but I sure am... I really hope the Cavs don't lose to the Knicks on Monday. A Cavs' loss to the Knicks would be embarrassing ~ not as embarrassing as losing to the Nets (i.e. let's face it, that wouldn't happen). Dear Anderson Varejao - Your numbers in the past 3 games have been decent (i..e 13.0 points and 8.3 boards)... You're playing well. Don't blow it. Dear Lebron - I read that you said it may take a while to recover from your collision with DeMar DeRozan... Please, rest up. T-Mac missed the second half of the game against the Grizzzlies, but he's currently listed as a probably starter for Monday night. I wonder if he'll play the entire game. My guess is NO, especially if the Cavs grab a huge lead early. Dear Knicks fans - I may have to eat these words later, but I think you're dreaming if you think LeBron is going to NY when his time is up in Cleveland. As a Cavs fan, I really don't think it makes any sense. I've heard the arguments about endorsements etc., but tell me what sponsors haven't been able to approach and find LeBron in Ohio? Yes, NYC is a great city and MSG is a storied building with a rich history ~ but this is LeBron. He can always just visit the city or even buy a place, go to the new Yankees' stadium, etc. and return to Ohio. Why would he want to rebuild the broken Knicks franchise? Now I know the rebuttal to that argument is that LeBron wouldn't have to do it alone. Presumably LeBron would have Dwyane Wade or Chris Bosh to help him win. Give me a break. Why would these guys want to take on that kind of responsibility? This isn't baseball, where you can buy the top talent and expect a championship (e.g. the Dallas Mavericks, back in the day, come to mind as an example of a "fail"). Basketball, although there are moments of individual glory, is a team sport. Chemistry is a huge factor, and you can't buy chemistry. Lastly, haven't you heard? Cleveland rocks! Can we all agree now that the Cavs don't need to be afraid of the Celtics? Yesterday, I received a message from a friend who asked me what I thought about him betting the Celtics +2.5 v the Cavs. Paul Pierce was going to be out, and the Celtics were at home. The person, who sent me the email, mentioned that he'd just watched a game where the Cavs didn't play much defense and were hoisting 3 points shot, etc. To be honest, I hadn't caught the last couple of Cavs games (i.e. or maybe I had, and just don't remember them). Anyway, since I hadn't "seen" the last couple of games, I told my friend he'd probably be OK. However, I added the caveat, that I didn't like "betting againt Lebron". ***I've been catching plenty of games (i.e. college and pro) lately on TV, and they're all beginning to swim in my head. I'm almost to the point where I want to start traveling again, so I can experience something "new" and hopefully more memorable. So here's what happened. Yesterday, I went to a Women in Sports Media Panel event; and therefore, missed the first half of the game. 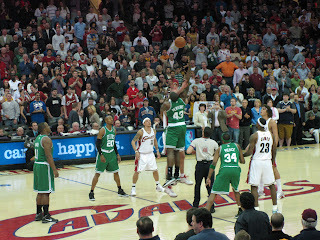 However, I managed to get out and catch most of the 2nd half of the Cavs v Celtics match-up. I actually figured that the Cavs would start out hot and have a huge lead v the Celtics, and that the Celtics would rally back on their homecourt for the win. Why? Because the Cavs haven't won on the Celtics' homecourt in their last 9 tries... I checked out the play-by-play summary, and it turns out that my assumption was correct, INITIALLY... Why "initially"? Well, by the time I planted myself in front of the TV and looked at the score in the 3rd Q, it was a relatively close game (i.e. working off memory it was 78-77, I think ~ but exact numbers aren't important here). At around the 9 minute mark in the 4th Quarter it looked as though, my initial guess would be incorrect. The Cavs kicked into gear and started SCORING. The Celtics might as well have sat on the bench and watched as the Cavs surged, since the scoring was so one-sided. In that final quarter, Mo Williams made four 3-pointers, and the Cavs BLEW OUT the Celtics 35-14. Yes, you read those numbers correctly. Wow! Can you imagine the feeling on the Celtics bench and the feeling in the hearts of all the Celtics' fans out there? I can only imagine what Bill Simmon's tweeted during the game... ***Just went to my Twitter and it looks like Bill was surprisingly quiet. Also, "Thank you," to everyone who contacted me regarding my Twitter account getting hacked last night. I'm not promoting the use of Viagra, but if it works for you and you're happy ~ "YOU'RE WELCOME". Final score of the game was 108-88, and the Cavs finally won a home game in Boston. Boston, I actually still need to hit that venue... ***Remember, I'm trying to hit a home game for every professional basketball, baseball, and football team. I'm up to 59 venues, right now. The last time I saw the Celtics in town (i.e. verses the Wizards earlier this month), Paul Pierce went to the floor injured and Kevin Garnett was playing in one of his first games back, since he was coming off of an injury. Everyone in my sports and social circles were telling me that as a Cavs fan, I needed to be scared of the Celtics. Well, I've said it many times before and I'll reiterate it now. The Celtics are "old", not healthy, and not to be feared. Last night's performance is further evidence that the Cavs should only be concerned with Orlando in the East. Speaking of Orlando... The main reason Cleveland picked up Shaq this season, was to add a large presence and be able to give up 6 quality fouls when the Cavs go against Dwight Howard in the playoffs. Shaq left the game last night with an injury to his right thumb. Did you see the video? Why did "Big Baby" Davis challenge Shaq to a "Thumb War"?!?!? Aren't they both LSU alumni, so can't there be some level of respect? Lol. Who knew "Mean/Bad Baby" Davis played a little dirty? Anyway... With an injury to Shaq, and Zydrunas not re-signed yet ~ the Cavs are vulnerable in the middle and must rely on Varejao's defensive play. It's no secret that I'm not a fan of Varejao's basketball skills... I must give credit where credit is due, and Varejao did play well last night. However, I continue to keep my finger's crossed EVERY TIME he steps on the court, and pray that he doesn't become a liability and ruin the Cavs' (i.e. and MY) dreams of an NBA Championship. Hockey will have my attention tonight. Canada v Russia at 7:30... I'm not leaving my house until this game is over. I don't want to type Ladai..'s name out AGAIN, but let's face it ~ the nickname, "LT" should only be used for Lawrence Taylor . So the NFL wants HGH testing, but the NFL Players Association is against it. Is anyone really surprised? The combine would be more interesting if they'd add events such as arm wrestling, tug of war, etc. then maybe I'd be curious and watch... Remember the obstacle courses on Nickelodeon's "Double Dare" or the game show "Wipe Out"? Wouldn't you buy tickets to see the guys perform those types of events ~ and see the speed, strength, and agility that they do/don't have? I would. Man... That'd be great!!! I tried to look this up because I distinctly remember watching some show when I was younger where Kevin Willis (i.e. the former NBA basketball player, that I'll always associate with the Atlanta Hawks) had won. I think the competition was sponsored by Jeep, and was held on the beach and had events like weight-lifting etc. It was great entertainmet and it was fun to see different athletes compete in different events. Wizards are playing the Grizzlies tonight. I thought about going ~ to see OJ Mayo play, but then decided I didn't care enough to spend the money. If anything, if forced to hit a Wiz game this week ~ I choose Friday's match-up v the Knicks. According to Michael Lee, the Wizards Insider, the Wizards (i.e. and I) are waiting for Zydrunas to sign the papers for his buyout. He's expected to pay back between $1 million and $1.5 million of his $11.5 million contract. He received a trade kicker worth about $600,000 for being part of the trade that brought him to DC. According to Lee, the "official word" should come out tomorrow but it looks like Zydrunas can re-sign with the Cavs, on March 18. If that's what happens, he'll make his home debut (i.e. 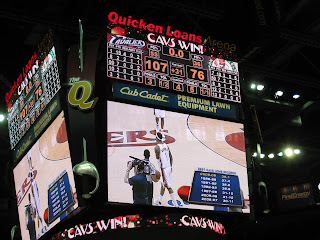 at the Q) on Sunday, March 21st against the Pistons. Can we please stop talking about Mark McGwire? I don't care. I will not buy the book. Enough. 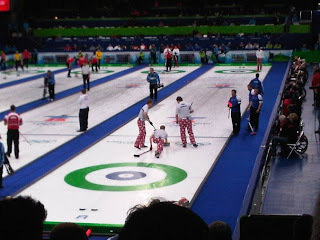 Yesterday I was up late trying to figure out a plan to head to Vancouver for the Winter Olympics. So last night, I started taking a closer look at it all. I could do flight easily (i.e. I have a magic chest of airline miles), event tickets were more than reasonable (i.e. I was looking at trying to do hockey all day on Wednesday - yes, Wednesday - yes, TOMORROW), and from what I heard it'd be very easy to walk to Canada Hockey Place based on the hotel recommended to me. The major reason why I'm not going to Vancouver tomorrow morning is hotel. Hotels are ridiculously expensive out there now and it's tough to justify that kind of expense for something I'm moderately interested in. I'm interested in checking out the Olympics, but not $500/night interested and I don't want a cheaper hotel that's farther out and then to have to fool w/transportation. Normally I'd say forget the hotel, stay out "all" night and then hop the plane the following morning. However, this is Vancouver ~ a city that I've never been to ~ so, flying there for one day for the Olympics seems silly. Some random thoughts about the Olympics and before any of my readers leave me notes/texts/comments/voicemails, I want to admit that I know nothing about these events. I'm a CASUAL Winter Olympics sportsfan. I could/would never figure skate with my brother. It's creepy. Meryl Davis DOES look like an Avatar character. This was mentioned to me last night, while at trivia. When I got home I googled it. Evidently, my friend isn't the only one that thinks this way. How cool would it be if she skated blue?!?! You don't need judges for ski jumping. There should be no scoring based on "technique". If you go farthest compared to any of the other jumpers, then you WIN. End of story. I wish I knew how to ski jump ~ that event is AMAZING. I can't even imagine how fun it must be to soar in the air that far. Whoever put the cameras on the skiers' helmets is BRILLIANT. The next Winter Olympics is in Russia. I've always wanted to see Russia... Anyone up for an adventure in 2014? Still waiting on the Wizards to buyout Zydrunas. Any day now, people... The deal needs to get done by March 1, so he can be eligible to play in the playoffs. Josh Howard is out for the rest of the season with a torn ACL. He injured himself during the Wizards' game last night against the Bulls. 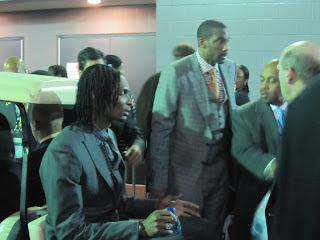 After playing in 2 games for the Knicks, I saw that Tracy McGrady has "knee pain". That's unfortunate for Knicks' fans, but it's no secret that T-Mac has a history of getting hurt and missing many games. I hate to say, "I told you so"... Sure, he showed flashes of previous glory, but the man just seems injury prone. I saw him, most recently (i.e. 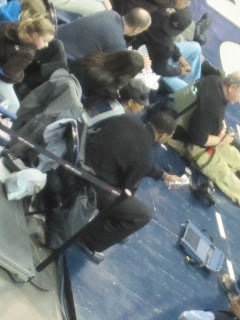 January 2010), sitting near the baseline at the Duke v Georgetown game at the Verizon Center. Incidentally, he was being praised, during the game, for his humanitarian efforts. I can respect that. The Cavs are losing to the New Orleans Hornets right now. It's half-time, and the Cavs are down by 3. Score is 56-53. I predict that they lose AGAIN. Chris Paul's not playing, because of his kne injury but good to see that he's traveling with the team and staying in the mix of things (i.e. heading to shoot around etc.). Here's hoping he has a successful and speedy recovery/rehabiliation. Jayson Williams was sentenced to 5 years in prison for shooting his limo driver in 2002. This Jayson Williams is not "White Chocolate" nor "Duke Jason". I remember this story back in 2002. I can't believe it's been 8 years. I'm not going to get into details, because you can read them for yourself ~ http://sports.espn.go.com/nba/news/story?id=4938372. This is a sad story for everyone involved. Maybe now, there can be some peace in his life and for the victim's family. The whole situation is incredibly unfortunate, and from all I've read and seen, I truly believe that it was an accident on William's part. Jayson Williams is eligible for parole in 18 months. It's like this... Earlier, the LA Times was reporting that the NBA will try to block Zydrunas from returning to the Cavs. According to some source the LA Times had, the NBA believes/believed there to be a previous deal in place ~ similar to the Stackhouse, Payton deals before, that would return Zydrunas to Cleveland. From what I've read, Phil Jackson and Doc Rivers have voiced their feelings about it and don't want the Cavs to get Big Z back. Duh. If I were the Lakers or the Celtics, I wouldn't want the Cavs to get a legitimate backup center. I wouldn't want a 7'3" man in the middle who's willing to pick up 6 fouls. Actually, now that I think about it, I remember playing basketball with Zydrunas (i.e. when we first started dating) and he wouldn't even let ME drive to the basket for a lay-up. I literally bounced off of his chest and almost hit the ground. He told ME that there were "no easy baskets"... SERIOUSLY!?!? This is a man that does not like to lose. According to Herb (Zydrunas' agent) there is/was no such deal in place and the buyout should "hopefully" occur today or tomorrow. The Wiz are well under the threshold, so they have some significant leverage. I guess if I were the Wizards, I'd try to give Zydrunas pennies on the dollar (e.g. 4% ~ hahahahahahaha) since they (i.e. like most of the free world) "know" that he doesn't want to be here and wants to go "home"... Another strategy, I guess the Wizards could employ is to "drag their feet" and see if the Cavs self-correct like they say they will. Admittedly, I'm curious to see if they will (i.e. I'm a doubter). Anyway... Still waiting on the buyout to be completed. A loophole is a loophole ~ fix it in the new CBA. This is not the time to make an example out of anyone. OK - I'm all over the board on this one so I'll warn you now... Here goes. I'm doing larger "bullets" again in the interest of speed, bc my brain clicks faster than I type. If I were the Lakers, I wouldn't be scared of the Nuggets. Went to friend's birthday celebration and ended up out with some friends. Engaged in tug of war, when someone I know mistook my scarf for hers and RIPPED it out of my hands, after I told her it was MINE. I can be a little feisty, sooooo this could've gotten ugly. However, the situation was handled calmly by another friend at the venue. Proper eyecare is important. What is more important than one's vision? Get your eyes checked regularly. Don't rip anything out of anyone's hand. People don't like this behavior. Went to College Park, MD and watched the Georgia Tech v Maryland game. On the way up there, one of the poeple in the car said that the line was Maryland -7.5. He asked who I liked. I told him I didn't like the number bc I didn't know what Maryland team would show up. When pressed, I told him to take Tech. He and his friend then told me I was "wrong". Needless to say, I watched the end of that game closely. Two amazing buzzer beaters ~ Maryland won. BUT the difference in scores between GA Tech and Maryalnd was less than 7.5. Maryland had an amazing win, but consistently inconsistent teams are tough to follow and cheer for, bc you can't trust your eyes and predict the future. Kid ~ wherever you are ~ I was RIGHT. Duke comes to town on March 3. I was at the game last year, but will have to miss it this year. With the ACC so weak it could be anyone's game, but I think Duke will win. I mean, they SHOULD win... Right!?!? The Cavs played the Magic today (rematch of the Eastern Conf Finals)... The Cavs lost and dropped 3 in a row. 3 in a row. Not wins. Losses. They lost 3 in a row, and they haven't done that in 2 years (i.e. I think). It's no secret how I feel about Danny Ferry, and the ridiculous trade that sent Zydrunas to Washington to hang out in my 'hood (i.e. bc let's face it, that's what Zydrunas is doing). I certainly don't see him puting on his #17 uni and running up and down the court. The man is listed as INACTIVE. As far as I'm concerned, Danny Ferry has single-handedly (ok, to be fair Ernie Grunfeld is equally to blame) imploded my favorite basketball team. Anderson Varejao is now Shaq's back-up. Are you serious?!?! Am I the only one that can still hear the screams of 20,000 (TWENTY THOUSAND) people yelling "GIVE IT BACK" the minute Lebron passed Varejao the ball in the final seconds of that one playoff game (that I'm desperately trying to forget) during the NBA FINALS!?!?! Everyone in today's game had a bajillion fouls (i.e. that's a HUGE number, people) as they ineffectively tried to guard Dwight Howard. Now I'm not saying Zydrunas is a defensive mastermind against Superman, "Part Deux", but at least he's not flopping around like a fish out of water like Varejao. GIVE ME A BREAK. Now before all you Cavs fans get in a tizzy, let me clarify this point above. I LOVE THE CAVS. I would NEVER have imploded the team, messed with the chemistry, and taken away a quality center when the alternative is some guy with a crazy perm who can't play basketball. IF, (1) Zydrunas makes it back, (2) the Cavs don't go on some crazy losing streak (i.e. bc of this trade), (3) they make it to the Finals, and (4) win the NBA Championship, then I'll be the first person to tell Danny that I'm sorry and that I was wrong. Until then, I'm scathing mad. I should start a moving company in Cleveland bc people are going to need my services. Hockey. Yeah, it's on today also. Russia already beat Czech Republic. All I know is that the final score was 4-2 and that Ovi had a monster hit on Jagr... Go Ovi!!! I get my news from facebook status feeds. Yawn... I bet the people at Cameron Indoor wish they could watch the USA v Canada hockey game. Hold onto your seats ladies and gentlemen, because tonight the Nuggets (36-18) play the Wizards (something little -something big)... It's gonna be a real barn burner! And if you believe that, then maybe I can interest you in giving me some seed money so I can head to AC or Vegas and quadruple it... Really?!?! You're a little bit interested?!?! Comment me with your email information, and I'll hit you with my paypal address. The Nuggets are coming off of an overtime victory last night at the Q. After the game, Carmelo Anthony "tweeted" that the game was an "instant classic". I don't agree, but he played in it, so he's biased. He finished with 40 points, 7 boards, and the game-winner. He played 48 minutes, and the total game time was 53, since it went into OT... My guess is that tonight he's going to be tired, since the game finished late (well after 1AM) and he played so many minutes. Anyway, back to tonight... Not only are the Nuggets playing the Wizards tonight ~ they're set to play the NEWLY, GUTTED Wizards tonight... What does that mean? That means that the Nuggets could probably sit Melo, Chauncey, and KMart and probably still win. I'm really hoping that that's not the case though because I'm headed to the arena for a multitude of reasons, and I want to see the "REAL" Nuggets on the court. During NBA All-Star weekend, I saw George Karl a number of times. Based on his press conference, George has known about his treatable throat cancer since December, but it seems he just notified his team on Tuesday. Whether, treatable or not ~ cancer is cancer and that has to be scary. My seats are near the Nuggets bench and I'll do my best to resist the urge to stare at George's throat... BUT I know me ~ even though, it's not like I'm going to be able to see anything, I'm going to keep looking. I am praying for his recovery. It has to be tough, but at least its "treatable". The Nuggets are the 2nd biggest threat in the West. The Lakers are without a doubt the 1st. At this point in the season, the Nuggets are 5 games back... During NBA All-Star weekend, I was talking to one of the Nuggets and he stressed that his job was to focus on the remaininng 29 games (i.e. 28 now, since they just played last night). I found that interesting ~ the fact that he knew exactly how many games were left in the season. Ask me how many more days I have this year, and I'll laugh in your face. Then again, I'm not an athlete nearing the end of the REGULAR season... Will the Nuggets catch the Lakers? I'm going to say, "No". BUT I do think, that in the West, they can defnitely give the Lakers a run for their money, especially if Kobe continues to sit out. The sad fact about tonight's game is that the Nuggets know that the Wizards are not even in their own league. This game tonight should be a yawner... I recommend that the Wizards adopt the WNBA's pricing model for the remaining games this season. 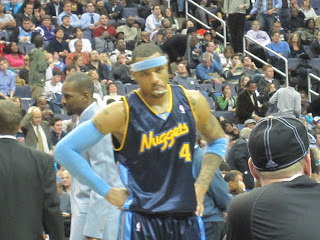 In addition to scouting the Nuggets and indulging in the nachos that have been promisd to me, I'm hoping Melo (i.e. since he is as close to home as he's going to get) still has some gas left in the tank for a great show tonight. And yes, of course, I'm curious to see if Zydrunas is going to be on the bench or even if he's in the building. I go where history is happening and if he's going to be on that Wizards bench, I'm not going to miss it for the world. So the matchup I was looking forward to all week is on right now and I have to admit, I'm bored. Moreover, from the looks and sounds of it ~ the crowd at the Q is bored also... (****Incidentally, I just checked Twitter and Bill Simmons posted the same sentiment about being confused that the crowd was dead... See, I'm not alone.) The score is Denver 100 and Cleveland 99 with 2:13 left on the clock in the 4th. It's GO TIME and it seems like everyone is in a haze in Cleveland. Question: Why is Jerry West at the game? OK - so I'm watching this game and something's missing for me. Where's Zydrunas? Oh, that's right - he's probably at home watching the game also. I was working today, so I missed Danny Ferry's press conference. It's probably for the best though, because I'd imagine it was geared more towards welcoming Antawn Jamison to the "promised land of the East". I did look to see if there were any quotes from the press conference of interest ~ and to be honest, I saw nothing. This is such a tight game ~ Denver is up 106 to 103 and... Oh wait ~ LeBron James just hit a 3 and the crowd goes wild, 48.5 on the clock... Ok, so the game is now tied. Let's go ahead and state the obvious. LeBron is the star and leader of the Cavs. Everyone in that organization bows down to King James. The owners, management, and coaches may be paying, "leading", and teaching him, but let's face it ~ they're all subjects in King James' court. Ok, Chauncey just missed his shot ~ we're going into overtime. Back to the point I was trying to make. We all value leadership and there are many different kinds of leaders in this world. Iron-willed dictators exist, who threaten and intimidate others, to make sure people fall "in line" under their regime or else you die by the sword. There are also more passive leaders who gently prod you into a direction that allows you to reach your goals and (with finesse) steer you towards self-actualization. Every leader needs someone on which they may rely. Jordan needed Pippen. Magic needed his supporting cast. And yeah ~ I can't help, but think Lebron needs Zydrunas. I remember when LeBron lept into Zydrunas' arms when the Cavs made it to the Finals in 2007. The image is everywhere. I'd include it in here, but I don't want to steal someone else's pic. LeBron had to seek Zydrunas out on the court and then jumped into his arms for a big bear hug. That picture says something. That's the type of relationship and veteran leadership that is palpable. That's the type of relationships oganizations strive to foster between a veteran and the future/heart of a franchise. I can't help but think that for the next few games, until a buyout is executed and Zydrunas returns to the Cavs (i.e. fingers crossed if that's the goal) that LeBron can't feel that someone/something is missing out on the court also. LeBron is 25 years old and Zydrunas is 34... Both have spent there entire professional career with the Cavs organization and it's no secret that Zydrunas holds the record for most games played as a Cleveland Cavalier. They both have grown up playing basketball for the Cavs. WTF. TNT just switched to the Celtics game! Ok. TNT went back to the Cavs game. Denver is up 116-113 with 30 seconds left on the clock... Lebron just drove ~ WOOHOO "AND 1". Nene just fouled out. Maybe this game will go into D-OT... I like it when great games don't end!!! OK - we're tied at 116 now. Carmelo Anthony just hit for 2 with 1.9 seconds to go. Denver up 118-116. Time out called by the Cavs. TNT is back to the Celtics v Lakers game. Wow. Some people are going to say this is a post-All-Star weekend let down for the Cavs. Nah, I have a different theory. I think the dynamic has changed for Cleveland and for me, it's OBVIOUS that LeBron needs Zydrunas on the court. Ugh ~ LeBron slipped once the ball was inbounded to him, threw up a 3 ~ but missed. The win streak is over now. I think it was 13 in a row. LeBron's not happy. 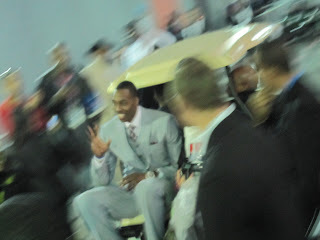 He just walked off the court. Back to my point, and yes ~ I'm BIASED, but I'm also CORRECT. LeBron especially, but the rest of the team also, needs Zydrunas on the court. Shaq is 38 years old. 38 years old... Wow. All the years in the league and Shaq can't deliver extensive quality minutes. Zydrunas can ease that burden. Zydrunas was supplanted this year with the Shaq trade and never complained about coming off the bench. In interviews Shaq referred to Zydrunas, not as his back-up, but as his partner and that says something. When Zydrunas was snubbed on the night he was supposed to break the record for most games played with the Cavs franchise, LeBron was the most vocal teammate and the first to call BS. He went to Zydrunas' defense and publicly stated that he thought his teammate and friend was treated poorly. There's a mutual respect and genuine closeness between LeBron and Zydrunas. In relationships, they say "If/When you love someone, set them free." I don't believe this cliche was meant to be used in NBA trades. I hope there was a "wink wink" agreement (i.e. after a contract buyout and 30 days) and that Zydrunas is brought back to the Cavs. However, I can't help but think that Zydrunas feels hurt/angry at the fact that the franchise dealt him away. After all the surgeries. All the surgeries ~ that left him with "cuts/indents" in his hips, scars on his foot, and sets of crutches in his garage... All the phone calls from the previous ownership (e.g. Gordon Gund) and visits from teammates both current and present when he was rehabbing (e.g. Coach Woodson and yeah, Danny Ferry)... The man was going to retire years ago, but he stayed, rehabbed, and played for all of you because that's all he EVER wanted to do. It makes me angry. It makes me upset. I don't play fantasy basketball. I would never make a good General Manager because I'm not into the business of looking at contract dollars and seeing who needs to be dumped. I am more human than that, and I can see relationships and chemistry. Good luck, Cleveland. You messed up, big on this one. Lucky for you, there's still a chance that the situation can be made "RIGHT". Actually I think I remember reading some of Danny Ferry's comments from the press conference. I remember reading that Danny said something about Zydrunas' jersey being raised to the rafters once his career is over. DUH, THANK YOU FOR STATING THE OBVIOUS!!! What's next Danny? Are you going to tell us that "water is wet"? Come on... The point is, Zydrunas' career is not over ~ you know it and I know it... Everyone knows his CAVS jersey belongs on his back, with him running up and down the court. Trade rumors are trade rumors. Usually rumors are based on gossip and are generally not to be trusted. Most people are taught not to listen to rumors because rumors are generally not true and don't come to fruition. Like an ostrich with her head buried in the sand, I never paid attention to trade rumors that involved my ex. Why should I? He holds the record for most games played for the Cavs franchise. He's played his entire career with ONE organization, since the day he was drafted in 1996. I'm not alone when I associate him with one city, one franchise, and one team. His expiring contract (he's slated to make $11.5 million this season) made him attractive to other organizations and there's always the option of a buyout, especially since he's been sent to a non-contender (i.e. the Wizards). The Wizards. He got traded to the Wizards. Of all the franchises in the league, he got put in my backyard again. Now that I think about it, I was born here in the USA, so I actually arrived in this country FIRST. I was in Ohio FIRST. I was born there and earned my BS and MBA there. When things ended between us, I left Ohio. That's right. I left the state. I didn't carve out a niche in a Cleveland suburb or move closer to my parents in Southern Ohio ~ I left the state. Now "MY HOME" is in the DC/VA/MD area. I arrived here FIRST. How do I feel about the fact that my ex just got dealt to a non-contending, issue-riddled, underachieving team in my BACKYARD? I am sickened and nervous for both of us. For him: At this point in his career, to be dealt to Washington, has to be a huge blow. He's just been dealt away from a Championship contender to a team that's being dismantled (i.e. read "BLOWN UP") and where the only real star is a man serving a suspension for toting a gun to the arena. Awesome.... For Zydrunas there's still time to be traded again (i.e. until the trade deadline of 3:01PM EST tomorrow) and there's always hope that his contract will be bought out and he can return to Cleveland in 30 days (i.e. collective bargaining agreement loophole). Incidentally he still lives in the same house we once shared (i.e. but now he lives there with his wife and kids). Yep, I was there FIRST also. But I digress... After all he has given to the Cavs' franchise to have him be dealt away is shocking. He believed in that franchise, pre-Lebron, and to take him out of the mix when everyone in that city can "taste" a championship is just plain cruel. I recognize it's a money game at this point. But damn... I liken it to Ewing being traded away from the Knicks. I couldn't stomach seeing him in a Magic uniform. Ewing is a Knick. Ilgauskas is a Cav. It's not rocket science, but obviously it's a business. For me: I don't mind being close to situations that are stressful, but there's close and TOO CLOSE. I liked the fact that I could go see the Cavs whenever I wanted and go relatively unnoticed. I liked the fact that I could choose "a la carte" what games interested me and hop on a plane and LEAVE it all behind. I liked being able to turn on the TV and see him play on my own terms and not have to risk potentially running into him on the STREET. Even in Cleveland I'd steer clear of certain sections of the arena and keep a low profile. I'd avoid certain bars and restaurants. Like I said, there's close and then there's TOO CLOSE. You know how when couples break up and people have to pick a side and everyone fights for territory? Well most of the Cavs organization took his side. That's fine. They paid his salary and he worked for them. I get it. I started over ~ moved to Atlanta and ultimately to the DC/VA/MD area. I carved out my own territory, where I know when he's in town, courtesy of the NBA schedule. One or 2 times a year he's here. Back in the days when the Cavs would play the Wizards in the playoffs, maybe at most, he'd be here an additional 3 times a year. I'm not sure how I feel about him as a "resident". Someone actually said something to me one day about me needing to get over it. Yeah, that person got an earful after that. Get over it?!?! What would you do if you were on a date and you went bowling, only to see your ex shooting free throws every time you rolled a ball down the lane? Ever been to a bar and have someone keep yapping about the Cavs, how much they love Lebron, and then hear his assessment of your ex's defensive skills? Ever watch ESPN and see your ex as a puppet in a Nike commercial several times a day? Ever see your name in a newspaper, written in a different language, and ask someone who speaks Lithuanian to translate it? Get over yourself. Relationships begin and end, but basketball is FOREVER. I am from Ohio. I am a Cavs fan. Nobody is chasing anyone. It's all for love of the game. If I wanted him I would've signed the papers and gotten married. I never did. I left town. Think whatever you want ~ but there's no disputing those FACTS, I appreciate his level of talent, hard work, and dedication to the sport. His trade to the Wizards is not going to make me a Wizards fan. A Wizards hat will never grace the top of my head. I will still be a Cavs fan. I will still make trips to Cleveland. No, my life isn't hard. But seriously... Why the Wizards? I don't want to be walking into CVS or a restaurant downtown and see him sitting at a table. Trust me ~ I see and run into EVERYONE. It'd only be a matter of time before he and I crossed paths. I expect and mentally prepare to be haunted by ghosts in Cleveland, but I don't want to be haunted by ghosts here. In Cleveland, I'm guarded and on defense but I don't have the energy to be on defense and be guarded here. I don't care that I sound like a 16 year old ~ I GOT HERE FIRST. I'll see for myself if this is for real or a bad dream... I'll be at the Verizon Center on Friday for the Nuggets v Wizards game... I wanted to see if the Nuggets are for real this year and have a chance to scout them before the playoffs. Now I have even more interest in the game. Dear Washington Wizards ~ Please buyout Zydrunas' contract before March 1st, so he can return to the Cavs. It's the humane and right thing to do. 2 Sundays ago, I went to my very first Super Bowl. Last Sunday (i.e. 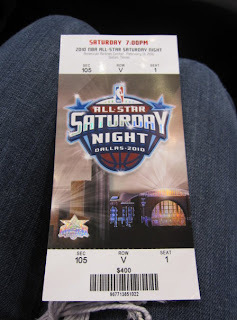 2 days ago) I went to my very first NBA All-Star game. Yes, I said it ~ "VERY FIRST". Some people find that surprising. Sure, I've been to Jam Sessions and All-Star Saturday night for the 3 Point and Slam Dunk contests... 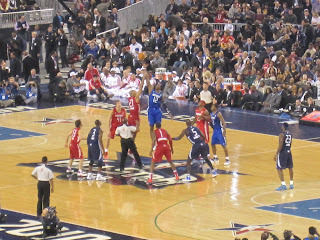 But, I've never made it to the actual All-Star game ~ until this year. This year's Super Bowl was historic. The Saints won it all in their 44th year as a franchise in Super Bowl XLIV (i.e. the 44th Super Bowl for those of you that are Roman numerically challenged). This year's NBA All-Star game was also historic. 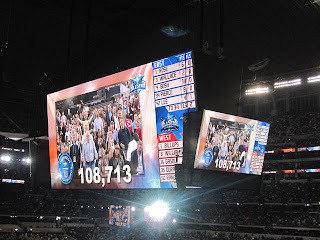 It was slated to draw a world record in attendance for a basketball game, since it was being played in the New Dallas Cowboys Stadium. For those of you, who are curious ~ and you know that you all are. Here is some video I found on youtube that shows how the floor of the new Cowboys Stadium was transformed to accommodate the 2010 NBA All-Star game. It's AWESOME. The NBA transportation took us to the arena easily. There was a long line for people to get into the arena. Fortunately for me, I didn't have to wait in that line... 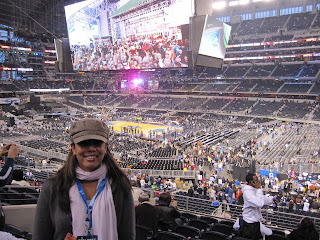 Inside the stadium, I couldn't wait to see the setup for the basketball game. A quick trip across the concourse and this was the view that I saw. After sizing up the arena and looking at the seating differences for basketball, I descended into the tunnels and was able to take in the scene prior to the player introductions. Kobe Bryant wasn't playing the game, but he was in the tunnels. After that scene got tiresome, I walked through the tunnels and went towards the floor of the stadium and took in the scene at "field level". 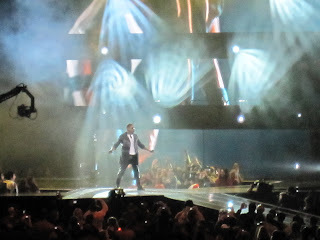 I couldn't believe I was so close to the action and the energy of the stadium was palpable. People were excited and you could feel it! More Kobe interviews were conducted, while Reggie Miller and Marv Albert were doing their pregame show segments. It's the NBA All-Star game. I've watched many of these through the years and the "formula" is the same. The players have fun for the first 3.75 quarters and begin to play for the win towards the end of the game. 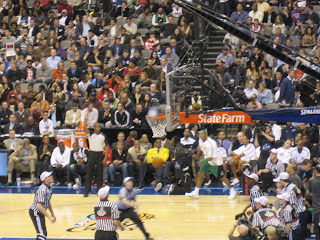 During the 1st half of the game, I scanned the crowd and enjoyed the action on the court. At half time, I was curious to see how the crowd would be managed as the players traveled what I'd like to refer to as "Lombard Street" at the new Cowboys Stadium... For those of you that don't know what that means, I beg you to travel to San Francisco and the curves of "Lombard Street" for yourself. Shakira and Alicia Keys performed at half-time. My only complaint was about Shakira's outfit, since it was a cross between Beyonce's "Single Ladies" leotard and Lady Gaga's outfits with the "shoulder embellishments"... All of them look great ~ but come on.... Can we please get some originality ladies?!?! 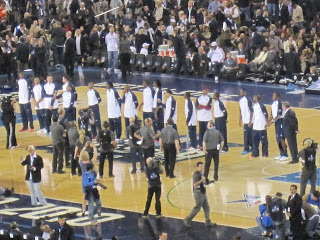 Also, at half-time, the USA Basketball team was presented to the crowd. 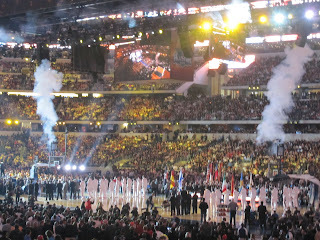 The 2010 FIBA World Championships are being held in Turkey this September. 27 marquee names on the roster include: LeBron James, Kobe Bryant, and Dwyane Wade, etc. For all of you Duke fans, I'm sure you'll be happy to know that the USA head coach is Mike Krzyzewski. With under 40 seconds left in the game, the score was tied at 137. This made some people nervous, because not many people wanted this game to go into overtime. Eventually the East won the game 141-139 and Dwyane Wade was named the MVP of the game. 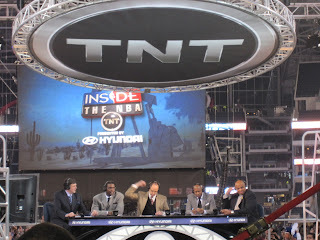 As the stadium cleared, I took some more pics around the stadium and watched the taping of Inside the NBA. 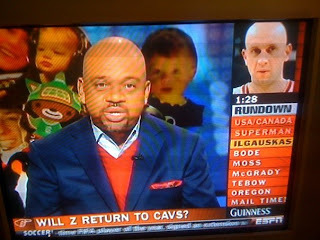 After the Inside the NBA was done taping, here are some gems that I was able to snap. By the time we all left the arena, it was LATE. I ended up chatting it up with PR and media people from all over the country. Ever sat in front of someone who's written about you in a newspaper and he not know who you were? I have and it's a very strange feeling. NBA ~ Where amazing happens! Hmmm... What happened on Saturday... Well, I can tell you what I didn't do much of on Saturday ~ EAT. I barely at anything. I risked starvation and lived to tell. I am, my own hero. We ended up at the players' hotel, and once we were able to get through the lobby (i.e. not an easy task without the proper credentials and stamps) that's where I spent most of the afternoon chatting it up with anyone and everyone. Incidentally, I was the only person "interested" (i.e. I use the term "interested" VERY loosely) in the Dayton v St. Louis men's basketball game that was being shown on one of the walls. Unfortunately, the UD Flyers gave up a HUGE lead and St. Louis won. Running around the hotel from office to office, I eventually came across Chris Kaman and immediately recognized a likeness in appearance to Zydrunas Ilgauskas... As far as I'm concerned, cutting his hair short is the BEST thing Chris Kaman could've done for himself. Some people would argue that improving his game was the best thing he could've done for his career. I disagree. Am I the ONLY person who remembers what he looked like with his stringy locks flowing and bouncing up and down as he ran the court? Ewww... Aesthetics are important to me. His hairdresser gets my vote for MVP. 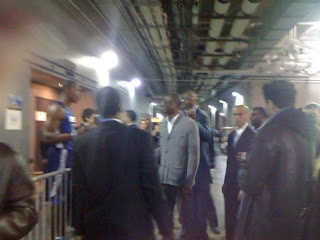 I also saw Kevin Durant, and he was carrying a McDonald's bag. I'm not going to lie, but I almost jumped him for his food. Seriously... David Stern would've had to replace KD on the roster, if I hadn't exercised self-control. 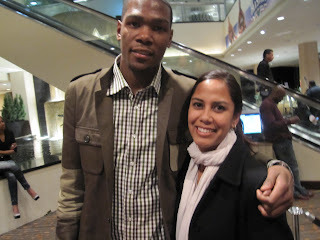 My friend and I eventually rolled out and went with one of her girls to an event for Kenyon Martin's foundation. It was at the modern, furniture store Cantoni, which is located closer to the Galleria. That reminds me ~ if you see me, ask me to tell you the Galleria rumor I heard... OK - back to my story. 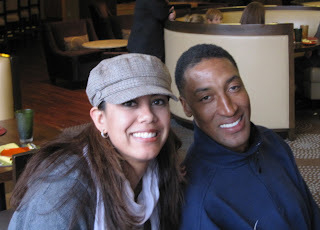 My friend is friends with Kenyon from the days when she used to work for the Nuggets. I remember watching Kenyon when he played for the University of Cincinnati. All I can say is Kenyon Martin is the BEST, since he had food ~ and I FINALLY had a chance to eat. Thank you, Kenyon, for the hospitality and the grub. You saved my life!!! While at the benefit, I noticed a petite lady who looked familiar from TV and movies (e.g. Jerry Maguire, 227 <-- Yes, I wrote 227, etc.). "She looks like Regina King," I said to Crystal. "She is Regina King," was her response. Hmmm... Ok, that was easy ~ and my eyes are still good enough to pick people out of a crowd. Regina looks great! My friend and I make it back to the hotel and barely have time to catch our breath before we hit NBA All-Star Saturday night for the 3-point challenge, Slam Dunk, etc. I meet Charles Smith (President of the NBA Retired Player's Association and one of the sources of my NY Knick broken heart) and Dale Ellis (I remember him as a Seattle Supersonic). Charles Smith is tall. I know tall. BUT, for some reason Charles looks really tall. The only thing I can think of is that it's because he's leaner than most of the NBA Players both active and retired. I shook his hand and told him I was a huge fan. This was not the time to bring up the bunny shots that he missed years ago... He replied that my comments were showing my age. Great reply. Dale mentioned he lived in Atlanta and we started to chat it up about the city, before I got called to run to the bus to the arena, run towards the bus, and abandon the Dale and the conversation. We get to the American Airlines Center and who do we see on the concourse? Ron Harper. Quick "hello", and we sort of keep it moving. Dikembe Mutombo walks by. John Barry and Mike Breen walk by. Who really needs a ticket? If you're restless or have a bad ticket, hang on the concourse and you'll see all kinds of people. Lucky for me, I had a good ticket. I make it to my seat and survey the crowd. It looks full, but it's a bit quiet. Looks like I'm just in time for the 3 point contest. I survey the seating by the court and notice Bill Russell is there. Immediately, I'm reminded that he didn't stop when I saw him at Dulles and asked to have my picture taken with him. I guess he's like that ~ but you still MUST respect his talent and all that he's achieved. 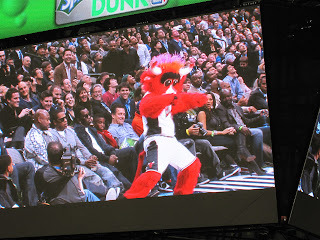 During one of the TV breaks, the Bulls' mascot was dancing to Beyonce's "Single Ladies" song, right in front of Jay-Z. He wasn't amused, but the crowd was. Paul Pierce won the 3 point contest and Nate Robinson won the Slam Dunk contest. Let's just put it out there. I recommend that they cancel the Slam Dunk contest until there's someone/something worth seeing. No offense to Nate ~ seriously, congratulations on the win ~ but many of the competitors dunks were boring. I would've loved to have seen Dominique Wilkins and Spudd Webb hold up a 5 for some of the dunks that were performed. Where was the showmanship and creativity?!?! Just like in schools, the Slam Dunk contest is suffering from "Grade Inflation". When are the judges going to stop giving away A's and B's?!?! Admittedly, I've never dunked ~ but I remember the greatness that I USED to see on TV. 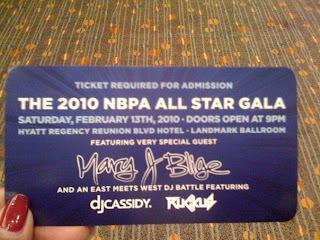 After the Slam Dunk contest we headed back to the hotel to get ready for the NBPA party (i.e. the Players party) which was held at the player's hotel. 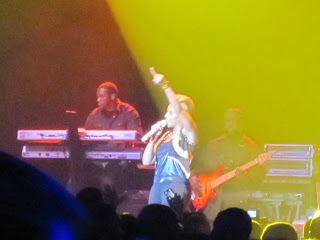 I've seen Mary J Blige perform before, but I was excited to see her again. We passed, yet another challenge to get through the lobby and with another handstamp for me we were on our way. 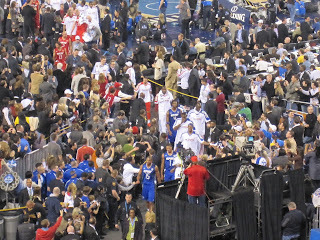 I saw Domnique Wilkins, Dale Ellis, Dikembe Mutombo, Chris Webber, etc. Ever see a 7 footer try to hide in a crowd?!?! It's hilarious. Poor Dikembe was trying to dodge every picture taker he could find. Enough was a enough, I guess. Two things that were notable at the party. 1 - Question: What happens when there are about 10 girls sitting on a pool table and 8 of them get up?!? Answer: The corner with the other 2 people left sitting buckles and the foundation cracks. 2 - Question: What happens when you don't have enough people working coat check and a HUGE party empties out and there is/are no line(s) established? ANSWER: A borderline riot. It was a great time to mix with old friends and meet new people. Everyone was happy and enjoying the good time. I was able to wish my friend, DA, a Happy belated birthday in person, as opposed to just throwing it up on his facebook wall earlier in the week. It was fun chatting it up with Ron Harper about the old Cleveland haunts (e.g. Spy Bar, the Flats, etc.) and dancing to all the hot tracks with my DC friends who also made the trip to Dallas. I noticed a shorter man having his picture taken next to me and instinctively I leaned out of the picture. 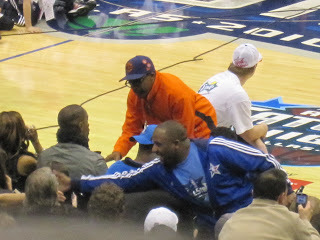 Afterwards, I asked my friend who it was that was next to me, and he told me it was Spike Lee. Ahhh, man... First of all, I should've leaned IN and not out! Secondly, just how short is Spike Lee?!?! 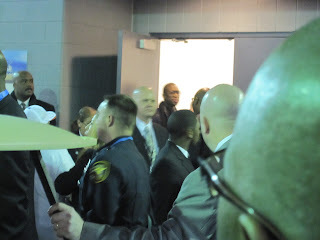 Russell Simmons walked by, and I was able to say, "Hello," as he slowly moved past with his people ~ the place was packed and no one was parting the sea of people easily. For anyone curious, Russell Simmons isn't tall either, but he's taller than Spike Lee. The main character, from "Hangin with Mr. Cooper" was milling about at the party, and that sparked discussion as to whether he was still "relevant". Needless to say it took me way too long to remember his entire name ~ Mark Curry. Kevin Love, David Lee, and Danilo Gallinari were there. Numerous ESPN personalities were there along with other media folks. 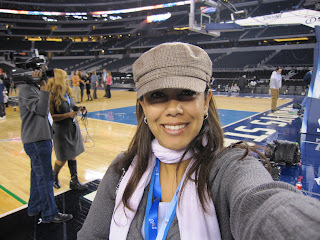 Alonzo Mourning walked out and his wife was wearng a hat and looked great ~ they were stylin'! At the end of the night, Lebron and his crew made it to the party. My first clue that Lebron was there was that I saw his mom, Gloria, walk past me. I've seen Gloria soo many times this weekend, I'm beginning to think she's my family too! 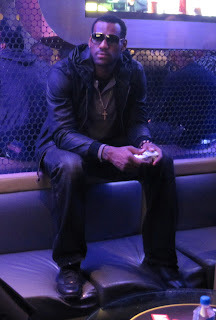 It was after 2AM, and the party was wrapping up ~ but Lebron made his appearance and was playing the video game and re-enacting the 2009 NBA Finals match up between the Orlando Magic v Los Angeles Lakers. As soon as that game ended, he and his crew left and the party was over. At events like this, some people expect me to come back with TONS of pics. The issue is that, that is simply not possible and will never happen. I normally keep my camera in my purse (i.e. it's much easier to take a picture when you're farther away from a person, as opposed to right next to someone), but on Friday night I was actually ASKED to snap a few pics, since the photographer had left for the night. Here's one of the 3 pics, that I took, for your enjoyment.